It has been a swatchy few weeks here in the West Coast PGS headquarters. Seems like everyone is getting their Winter stuff all wrapped up, which means a flood of swatches to share! This one is not new, as I teased the hell out of it before Black Friday on our Facebook page. It is time to share (most) of my swatches! The duo I was asked to swatch is called the Abominable Snow Monster Duo. Now, Dave doesn't know this, but he was actually my favorite character from those stop-motion Christmas specials as a kid. I once saw a set of toys on clearance (at Mervyn's for you old folks) and bought them just so I could have him and Yukon Cornelius. And no...the kids aren't allowed to touch them. 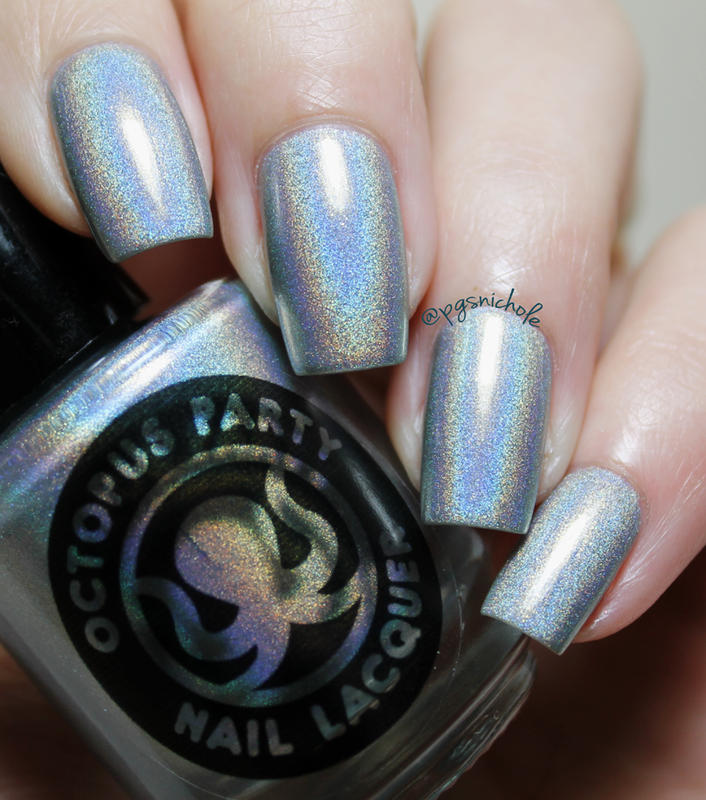 This one is a lovely, icy blue linear holo with tiny blue flakies. I only needed two coats below, and it dries smoothly. 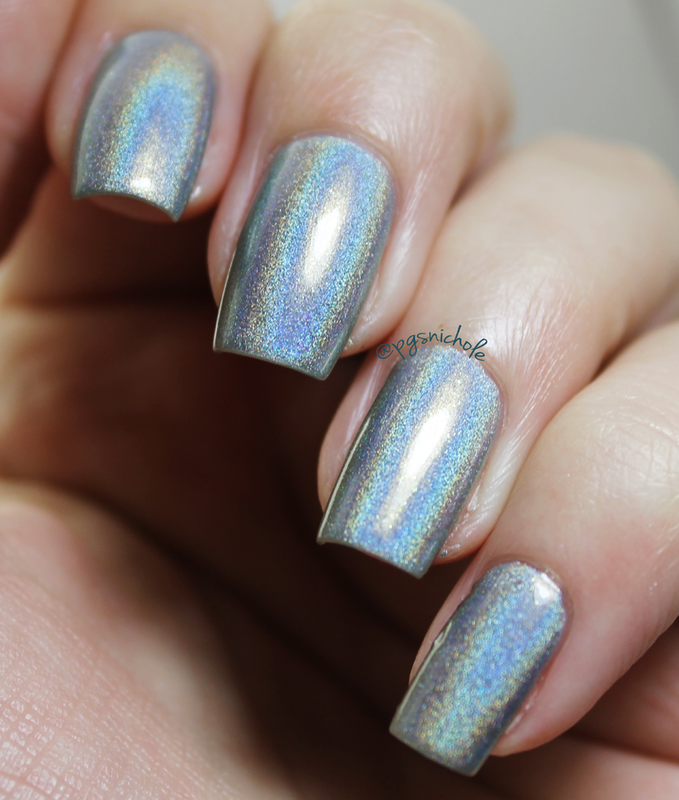 If Cinderella were going to wear a holo, this would be the one. It has a lovely warm undertone which keeps it from being boring. I dunno the particulars of why this happens, so lets just say it is magic and be done. The other half of the duo, from a new-to-me brand called BaronessX, is a white microglitter with two different colors of holo glitter. If you needed a perfect polish for a snow storm, search no further. It doesn't quite work alone, but it is a very dense topper. I only used two thin coats below over The Bumble, and I bet it would go opaque in a third. I can't wait to actually try some wintery art with this particular polish. I see spooky storms cozy snow drifts in my future. Of course, I think I got the best duo, but really they are all amazing. I kinda love seeing things like this, because not only do we get a deal when we buy the sets...it also pushes these indie makers out of their comfort zones a bit, and only good things can come to us from this stretching of their creative muscles. we need to find someone who IS made of money. Then we can be crazy cat ladies together, and buy all the nail polishes.